« From $269,900! The Spot on Cambie Vancouver Westside Condos for Sale across from City Hall & Canada SkyTrain Line > The Spot Vancouver Condos Launching Summer! Looking for an affordable Vancouver condo in the heart of the city? Look no further than the presale Vancouver Bold on Fraser Street condos! The modern architecture is by award winning firm Francl Architecture and construction is by Kindred Construction. The beautiful and modern interiors at the Bold on Fraser Vancouver condo project is by ID Lab Inc. The mixed use development is located centrally at 3501 Fraser Street Vancouver. The presale Vancouver Bold on Fraser condos will feature only 27 two bedroom suites and three one bedroom and den homes, giving singles, couples and families a great choice of spacious floor plans to choose from for their new home. In addition, all of the floor plans allow for usable and efficient outdoor living space that extends your interiors outwards. As well, the master planned East Vancouver Bold on Fraser condo project will feature an inner courtyard designed for increase in natural lighting and air circulation design for better urban liveability. The project will also include an amenities/meeting room with a small kitchen and bathroom which is great for entertaining or relaxing in addition to an underground secure parkade. There is bike storage and spacious storage lockers for home owners as well. All homes at the presale Vancouver Bold on Fraser condo project includes the 2-5-10 New Home Warranty by Travellers Insurance. Some addition features of these new homes in East Vancouver will include NEST Thermostat for year round comfort, fibre optic by TELUS and one year of free Optik TV and internet included with your home purchase. There is restricted floor access and fob security too. The penthouse units at the new Bold Vancouver condos will include individual hot water on demand boilers too. For more information and availability/pricing, please visit the web site at www.boldonfraser.com today and register your interest. The gourmet kitchens at the new Bold Vancouver condos on Fraser Street will feature contemporary wood veneer cabinetry and premium quartz stone counters. The kitchens will also feature a Whirlpool appliance set that includes a 4 radiant burner cook top stove with self cleaning oven (the penthouse units have KitchenAid brand) in addition to a Whirlpool 28” wide fridge with bottom mount freezer, Whirlpool six cycle dishwasher (Energy Star rated) and Whirlpool 220 CFM microwave hood fan. There is recessed pot lighting over the upper cabinets in addition to an under mount double bowl sink and urban Euro style faucet. The contemporary interiors at the new Vancouver Bold on Fraser condos includes warm earthtone palette designed by ID Lab Inc. In addition, the homes will have premium engineered wood floors throughout, ample floor to ceilings windows in most living spaces and functional open style kitchen with lots of entertainment and work/cooking space. The homes will also feature sleek aluminum window blinds for added privacy and recessed pot lights over the kitchen area. The spa inspired master ensuites at the Bold on Fraser Vancouver condos will feature oversized porcelain tiled floors, tiled tub and shower surrounds and a 59” soaker tub. Other master ensuite features include a contemporary Grohe polished chrome accessory package including faucets and showers in addition to a TOTO dual flush toilet with soft close seat. Something bigger, better and bolder is coming. Don’t fade into the masses; stand up and lead the way. Located at 3501 Fraser Street Vancouver, the Bold on Fraser Vancouver condos features one and den and two bedroom apartment residences above ground floor retail in this evolving neighbourhood. Here are some of the spacious floor plans featured at Bold on Fraser Vancouver apartments. 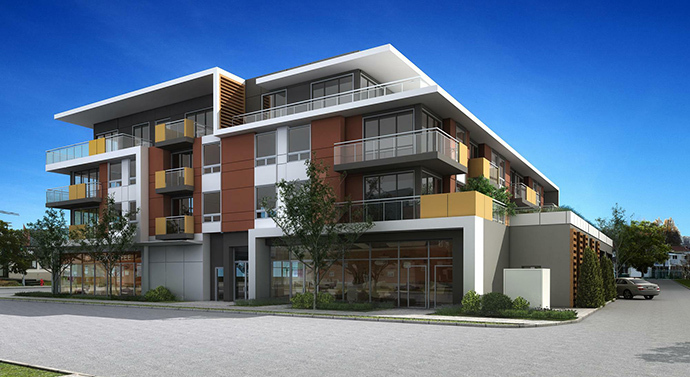 A statement is on its way – a stunning condo that will further reinforce the maturation of Fraser Street north. BOLD Vancouver condos will expand your horizons, as well as your outlook. Don’t fade into the masses; stand up and lead the way. Live a local life > The BOLD Vancouver condos sit at the hub of the ‘new’ Fraser Street. You are perfectly placed to discover new hipster hangouts, independent eateries and boutiques, as well as staying connected with the places you’ve made your own. 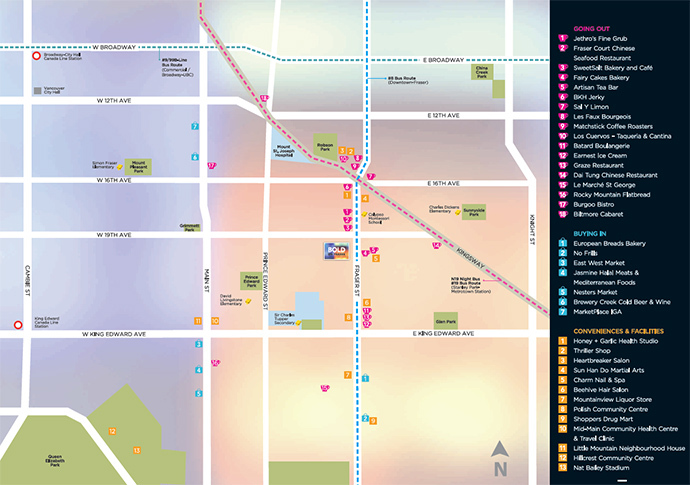 A Bold new neighbourhood > With a Walkscore of 92 – 14 points above Vancouver’s average – you can get to all the necessities on foot and within minutes from the presale Vancouver BOLD condos. The transport network at your disposal will serve you well, keeping you well-connected and well-satisfied. Add to this a ground-floor retail offering and you have yourself a bold proposition. See your future in BOLD > Francl Architecture and Kindred Construction have designed and crafted the BOLD condos with the sophistication you expect from west side homes, in an east side context. The BOLD style challenges convention and speaks loudly of a higher standard. 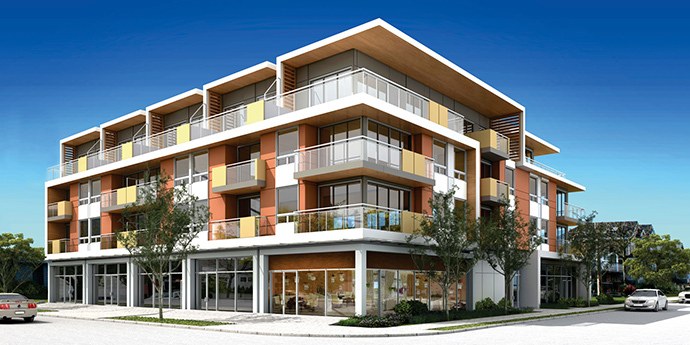 Livability for Affordability > BOLD Vancouver condos provides layouts that crack the design code. Through a total rethinking of functionality, these condos demonstrate a new breed of affordability, providing more livable, usable square footage for less.